A modern home needs modern accessories, and if you are struggling to find the perfect contemporary kitchen taps to suit the style of your home, you have come to the right place! HC Supplies is the renowned stockist for low price contemporary kitchen taps, which enable customers to purchase designer taps at rock bottom prices. We have amazing discounts on our entire range of kitchen taps, work surfaces and sinks. Take a closer look at our beautiful contemporary taps from Astracast, and complete the look of your kitchen without blowing your budget. One of our most popular contemporary taps is the Quadrant tap from Rangemaster. Available in brushed steel, or chrome, the Quadrant is a perfect example of how contemporary taps have evolved beyond the practical and into luxuriously attractive kitchen accessories. We only stock the most reputable products from established companies to ensure pur customers receive the most robust products that will last for many years. Take your pick from beautiful contemporary taps, and have them delivered safely and swiftly to your home. If you aren't certain which contemporary taps you need, give our advisers a call. Stay on trend when you buy your contemporary kitchen taps from HC Supplies. We are always perfectly up to date with new styles, trends, and features that can help completely transform your kitchen into the modern room you want it to be. Our experts source taps from the most revered designers, researching what customers want and need, and what contemporary taps are sturdy enough to withstand the pressures of the modern kitchen. Contemporary homes are all about convenience, and we aim to ensure each accessory helps make domestic life so much simpler. Browse our contemporary taps UK collection today. 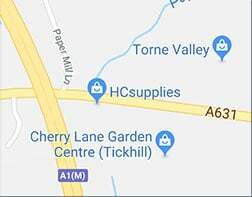 HC Supplies will never compormise on the quality of the products we sell, but we do always compromise on price, allowing customers to benefit from massive savings on the recommended retail price of all our items. There really is no need to pay excessive prices for quality goods when you can purchase them online, on our user-friendly website. Once you have made your purchase, you will want to know that your items will arrive on time and in pristine condition. This is why we only employ the most highly trained and reliable delivery drivers to ensure everything your order is safely and promptly delivered. UK residents can expect to receive their items within 2 to 7 working days from purchase. Do you need your items shipped abroad? We can do this too, and our customer services team will be happy to organise delivery outside the UK and even to addresses outside Europe. Simply call our team after purchase, or contact us via the online form. Should you have any questions about our contemporary taps range, or wish to discuss the design of your kitchen, give our advisers a call, and discover how we can help to make your house a home.